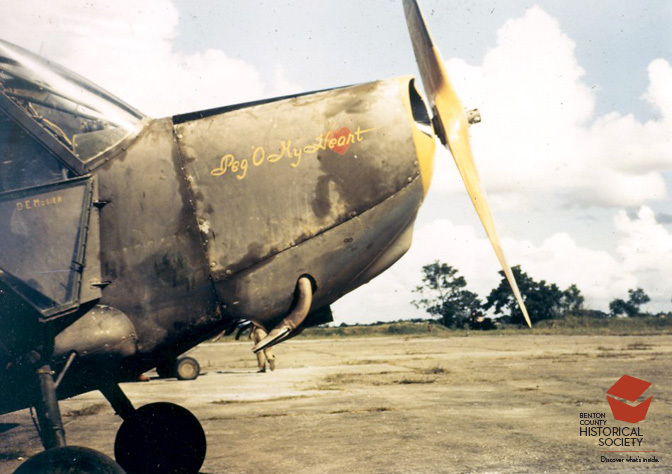 Like many pilots during World War II, Dewey Mosier named his plane and painted a matching picture on the nose. Peg O' My Heart was a popular song written by Alfred Bryant and Fred Fisher which was featured in the 1913 Ziegfield Follies. It was also popular name with pilots whose wives or girl friends were named Peg. In addition to pictures of young women, other popular themes for nose art were cartoon figures, jaws and other depictions of fierce animals, and satirical drawing of the enemy.